Einer der besten Arbeitsplätze der Welt (bzw. im erdnahen Weltraum): Das Cupola-Modul der Internationalen Raumstation mit seiner Konsole für den Robo-Arm (rechtes Fenster). Dazu unsere blaue Murmel im Hintergrund. This image of the interior view from the International Space Station’s Cupola module was taken on Jan. 4, 2015. The large bay windows allows the Expedition 42 crew to see outside. 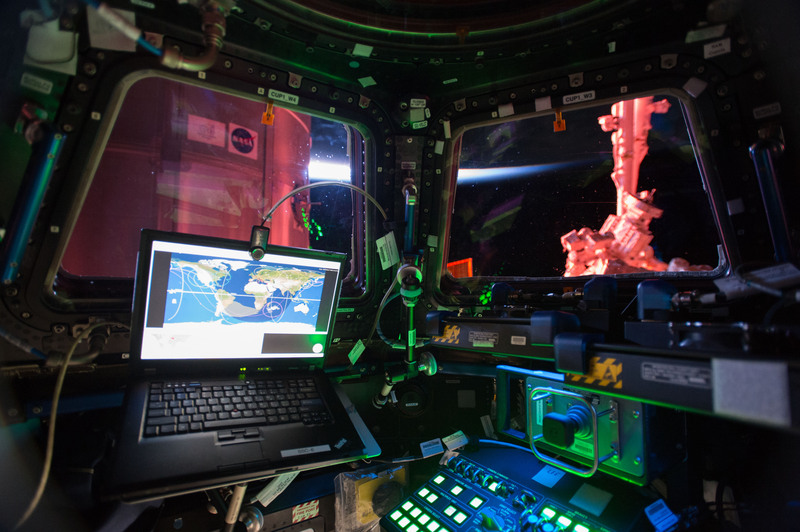 The Cupola houses one of the space station’s two robotic work stations used by astronauts to manipulate the large robotic arm seen through the right window. The robotic arm, or Canadarm2, was used throughout the construction of the station and is still used to grapple visiting cargo vehicles and assist astronauts during spacewalks. The Cupola is attached to the nadir side of the space station and also gives a full panoramic view of the Earth.